Late in the year just past, I bought myself a present. And I used Ebay for the first time. Richard’s entered the twenty-first century, and yes, folks, that is the first horseman you see galloping over the horizon. Well, not quite… because the present is a camera that was made in the first half of the last century. It’s a pretty little Voigtländer Brillant V6 (that’s not a typo – in England, these were sold as “Brilliant”). Voigtländer was, and still is, a well-respected name, located in Braunschweig at a time when Germany arguably ruled the photography industry. Although it looks like a twin-lens reflex, it’s more accurate to call it a box camera that happens to have a very elaborate viewfinder on top. The top lens doesn’t focus, just like the viewfinder windows in modern pocket cameras. The bottom one takes the photo, onto glorious, medium-format, 120 format film, which by some miracle of history you can still readily buy in better camera stores nearly everywhere. I know: why? Well, for starters… just look at the thing! It’s gorgeous, and as a bonus was very cheap. These were the point-n-shoots of the day. Contemporary professional cameras were much fancier, and are as a result more collectible and expensive. The second reason, as put by my good friend Markus, is that “film makes you think”. A good way of combating the digital-era temptation to take 500 photos to keep one, is to use a camera that takes significant fiddling to get to work, and even more to obtain the image once you’ve fired the shutter. So what the heck did I buy, exactly? All things considered, there’s a remarkable lack of information on the internet about production dates for these. While it seems well documented that the V6 appeared in 1937, it’s not clear how long it lasted, although this page says 1938-1939 (note the inconsistent start date though). Various places speak of post-war versions, and it certainly co-existed alongside its later (and better) sibling, the Focusing Brillant, as shown in the 1939 advertisement on this page. This brilliant (ha!) page features several lovely examples, with various combinations of shutters and lenses. The one matching mine, with a Compur shutter and 7.5 cm Skopar lens, is the 1937. The better lenses of the later models, and a discussion of the logo size of the 1949 variant, also suggest that mine is pre-war. That’s not particularly rigorous research, I’ll admit. A trip to the library to take a look at the breathtakingly expensive McKeown’s might be in order. 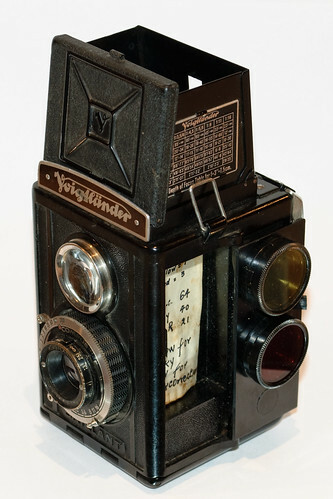 Contacting Voigtländer isn’t likely to help much – the company as it was no longer exists. The name has changed hands many times, via Schering (!) as well as two of the biggest names in vintage cameras, Zeiss and Rollei. It’s now part of Cosina. So I can’t date it reliably, even with the best Google-fu I possess. Let’s ask a more pressing question. It’s nearly seventy-five years old. Does it work? 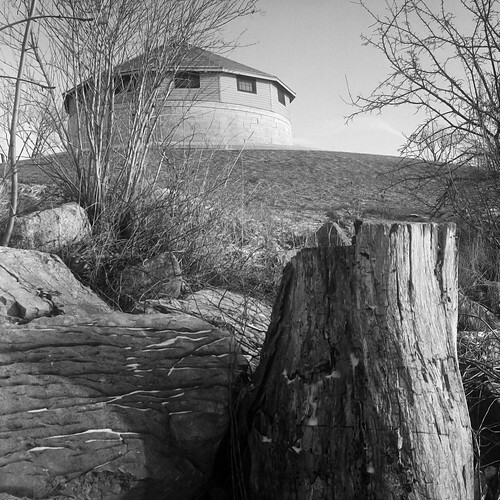 Murney Tower, Kingston, Ontario. It was bloody cold, let me tell you. I had to wait a week to get the film developed, but I almost fell over when I saw this. The exposure is good, the subject is in focus, and the lens is sharp! That’s three out of three. I wasn’t even expecting one. I was also curious about what kind of field of view the camera sees. Many vintage fixed-lens cameras approximate the “normal” angle of view, similar to what the unaided eye sees. Although individual eyes differ, and there’s always the question of where, exactly, our perceptual and physical fields of view actually end, most people accept a 50 mm lens on the “full frame” of 35 mm film as about right. The question becomes even more confusing once you consider that field of view depends on the complicated interaction between the focal length of the lens, distance from the film (or digital sensor), shape of the target (sensor or film), and the thorny issue that the openings in camera lenses are generally round or close to it, and film frames and sensors, for the most part, aren’t. For non-square formats like 35 mm film, the vertical, diagonal, and horizontal angles of view all differ. The photos this camera takes are square. Whatever. 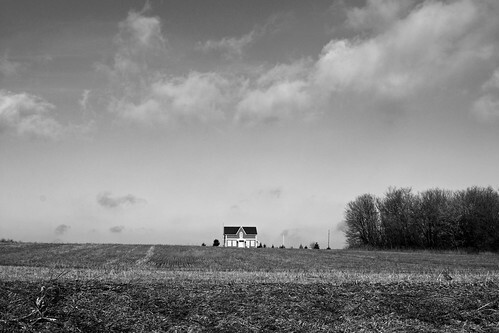 Farmhouse, Concession Road 8, Durham Region. Inspired by rpg’s recent trigonometrical excursions, I performed some experiments looking at a yardstick through the viewfinder, and comparing with the view from different focal lengths of a zoom lens on my DSLR. That resulted in a calculation of about 88 degrees on the horizontal, which is in the right ballpark, but more tellingly, it was when the zoom’s focal length was dialed to 35 mm. Correcting for the sensor size/geometry gibberish alluded to above, 35 mm on my Nikon DSLR is equivalent to the field seen by a 52 mm lens on full-frame 35 mm film… almost exactly that “normal” lens we met above. Which was validated nicely when I finally got the film back, and compared it to the DSLR photo of the same subject, which by happy coincidence design was taken through my 35 mm lens. The horizontal field is almost exactly the same, from the fuzzy foliage on the horizon at left to a dip in the trees at the right edge. But look at the height that the square Brillant film gives! That’s a whole lot of sky. No wonder Ansel Adams wrote in The Camera that when shooting in medium format, he preferred to shoot squares, and visualize how he wanted to crop them later. 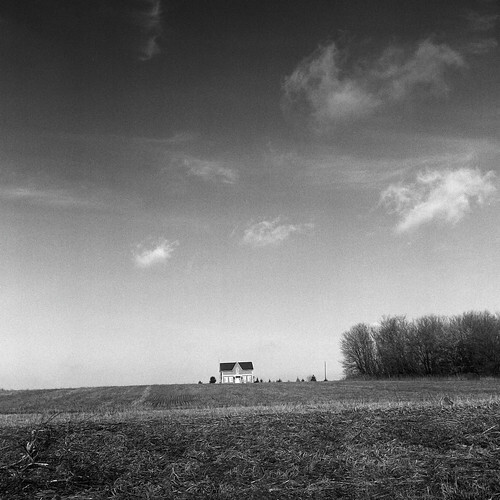 The same farmhouse through a modern camera. I had to use Photoshop to make this one black and white. Comparing the two farmhouse photos reveals that the modern Nikon is much sharper. No surprise there – it’s made of eight pieces of glass including one complicated aspherical one, magical Nikon coatings, and other 2010 technology. The Skopar in the Brillant is I believe made of four elements and is uncoated. It’s also darn near 75 years old and was dusty when I bought it. But I’m very happy with the results so far, and will use some lower ISO, less grainy film next time. This hasn’t all worked perfectly, of course. Of the twelve exposures on that roll, I double-fired the shutter on one, mis-fired on another, and motion blurred a third. A couple were boring test shots. And the scans could be better. But I’m very excited that it actually worked, with no odd lens anomalies, jammed film, or spurious light leaks. For my next trick – colour. More photos in this Flickr set. I am Canadian by heritage, and a molecular biologist and human geneticist by training. My day job is Assistant Director of a large genome centre, where I do various things along the lines of "keeping the wheels on". In my spare time, I tend to run around with a camera, often chasing race cars, abandoned barns, and sundry wildlife. This entry was posted in Hobbies, Photography and tagged Brillant, Brilliant, camera, film, hobbies, hobby, Photography, Voigtländer. Bookmark the permalink. Thanks. Got two rolls of film the other day (one colour, one B&W). I might wait until the weather warms up a bit before I try them out though! I don’t understand all the technical stuff, but this is AWESOME! I hope you’ll keep posting your photos! Mr E Man has also been using antiques bought on eBay – carpentry tools, in his case. Apparently the steel used as standard in older tools is of a much higher quality than the bog standard stuff used today, although you can get good modern tools if you spend a fortune. But why bother when you can buy a whole bag of chisels for $20 on eBay, get the tools guy at work to sharpen them up, and use them for the rest of your career?! He’s also bought a couple of planes and assorted other things. Yeah… I don’t *really* get all the angle of view/field of view stuff either, to be honest. The empirical evidence that the Nikon and Voigtländer photos span the same width is really what counts. Probably I should just have ignored all that and concentrated on what I could see through the viewfinder, anyway. Update – the camera is still more or less 1937-1939, but the serial number on the Compur shutter mechanism indicates the shutter was produced in 1935. That’s not so unusual – Compur shutters were well respected and reliable, and Voigtländer may very well have fitted two-year-old (or older) shutters to their cameras. There’s also a terribly unrevealing serial number on the rear housing of the lens, inside the camera.